Futures betting explained. Which team will win the Super Bowl, NBA Finals, Stanley Cup or March Madness? Learn how betting season win totals can be profitable. Bet multiple teams in same futures market to diversify risk. Know when to hedge your futures bet. Identify +EV and arbitrage betting opportunities with my handy guide. Sportsbooks offer odds on distant events. Bet wins or loses after event has concluded. The most common future bets include picking season champions, win totals or player awards. Major horse races like the Kentucky Derby also have futures odds. Select sport or horse racing. American Sportsbooks list odds as moneylines. Some horse racing odds may be fractional. Make one or more selections and bet desired amount. Exotic bet. Major events like the Super Bowl will have odds before the NFL season begins. The same is true for the NBA, NHL, MLB and college sports. Sportsbooks post horse racing futures before major races. Kentucky Derby futures betting starts in September with the first prep races. American Sportsbooks list futures odds as moneylines. Some horse racing odds will be fractional. Sportsbooks often give futures with 3 or more selections all positive values. This typically happens until an obvious favorite emerges. Look for favorites once post-season play has begun. Season win totals will have one negative and one positive value. These numbers assign odds to outcomes above or below a win total. Sportsbooks consider the negative value the “favorite”. It is most likely. The positive value is the underdog. It is less likely. Futures bets last until the season or event have passed. This process may take weeks or months. Odds will adjust as the event or season conclusion approaches. Ineligible teams, individuals or horses will be removed from an event’s futures odds. Previous bets on these selections automatically lose. This typically happens when a team does not qualify for the playoffs. The same is true for horses that are injured, disqualified or scratched. Some futures cannot be added to parlays. See sportsbook rules. Some sportsbooks list futures odds as moneylines. Read more about betting the moneyline here. Decide if Bulls will win greater or fewer games than sportsbook’s line. Note: Bet is like an over under total bet. Bettor chooses under 42½ EV money. He believes Bulls will win 42 or less games. He risks $100 to win $100. Select the next Kentucky Derby Winner. Note: Futures will contain all possible horses. Sportsbooks will add prep race winners as results become available. Bettor chooses Audible. He risks $100 to win $800. Select the next Stanley Cup Winner. Tampa Bay risking $110 to win $100. Vegas risking $100 to win $400. Futures bet wins if prediction is correct. Bet loses if prediction is incorrect. Ties are not possible. Bulls only win 39 games. Bettor wins $100 for risking $100. Audible gets injured a week before the Derby. Bettor loses $100. Audible can no longer compete. Tampa Bay wins Stanley Cup. Bettor wins $100 for risking $110 on Tampa Bay. He loses $100 on Vegas. Bettor wins $400 for risking $100 on Vegas. He loses $110 on Tampa Bay. Small minimum bet. Make one or more selections. Win big with longshot underdogs. Sportsbooks list futures with moneyline or fractional odds. 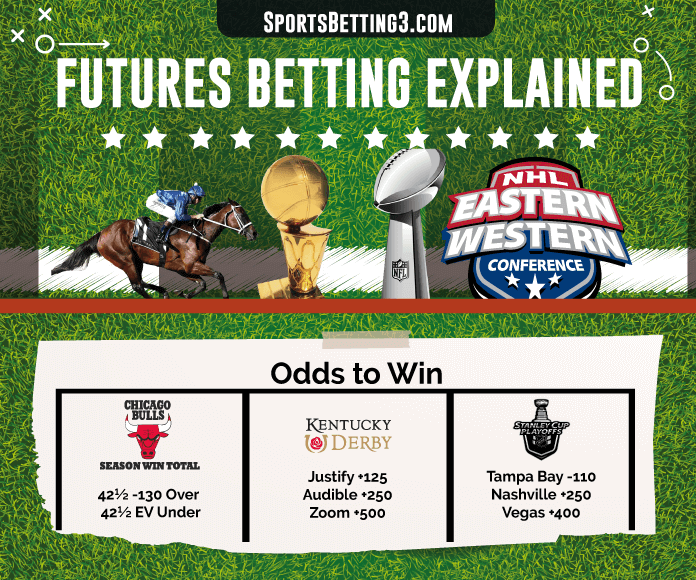 Each sport has multiple future betting opportunities. NFL fans can predict the Super Bowl, NFC, AFC or Division winners. Future betting establishes a long-term rooting interest. Selection must be successful throughout the season for your bet to win. Futures bets are hard to win unless you choose an obvious favorite. Sportsbooks profit on these bets more than bettors. Low probability selections often get eliminated from contention before playoffs begin. Risk is not worth the reward. Sportsbooks use futures odds as marketing tools. They are usually sucker bets unless you are an expert handicapper. Futures betting ties up bankroll for weeks or months. Shop odds. Multiple sportsbooks will have lines for the same futures. Search for the sportsbook offering the best odds for each selection. Bet each selection at separate sportsbooks if necessary. Calculate a future market’s overround to determine whether Expected Value or Arbitrage bets exist. Combine lines from multiple sportsbooks. See example in Tables and Reference below. Assess each team’s likelihood of wining a championship event after a few weeks have passed. Betting before the season begins is risky. Wait until you have more information. Sportsbooks will adjust futures odds on a weekly basis. Bet Season Win Totals when in doubt. Place these bets before the season begins! Experienced bettors prefer win totals to futures. It is easier to predict one team’s performance against a sportsbook’s line. Predicting championship potential is more difficult. Consider hedging your futures bet if your selection makes the championship event. Place a moneyline bet against your team to breakeven if they lose. See example in Tables and Reference below. Super Bowl Futures. Pick the next Super Bowl Winner. Choose multiple teams to manage risk. Final Four Futures. Pick the next NCAA Basketball Champion. NBA Season Win Totals. Decide if a team’s season win total will be over or under the sportsbook’s line. Bet on multiple teams to diversify risk. Stanley Cup Futures. Pick the next Stanley Cup Champion. Kentucky Derby Futures. Pick one or more horses to win the next Kentucky Derby. Prediction markets date to 1503 when people bet on who would become the next pope. Wall street made its first election bets in 1884. The first electronic prediction market opened during the 1988 Presidential Race. The University of Iowa created its own “Iowa Electronic Markets”. Others subsequently created various prediction markets for speculation and corporate research. Many believe prediction markets are more reliable than polling and research. The Efficient Markets Hypothesis drives valuation. The EMH theory asserts asset prices fully reflect all available information. Thus analysts can derive a probability from market prices. Investors are more careful when money is involved. They less willing to take big risks and more likely to hedge. Sports futures are an outgrowth of traditional prediction markets. Online sportsbooks have offered futures odds since online sports betting began in the late 1990s. Similar businesses have also capitalized on prediction markets. Ireland’s now defunct TradeSports.com once served as a popular futures broker. Customers could buy and sell contracts on any number of events. These markets would often accurately predict many outcomes. You bet $10 the Bears will be Super Bowl Champions +1000. You risk $10 to win $100. The Bears make the Super Bowl. They are facing the Ravens -120 Moneyline. Bet $12 on the Ravens to win $10. Breakeven if the Bears lose. Profit $88 if the Bears win. Calculate each team’s breakeven win percentage. Divide $100 Bet by Payout. ($100)/(Bet + Win). Add each team’s numbers together. Sportsboook included juice if sum >100%. This number is the called the Overround. Numbers closer to 100% indicate higher +EV. Numbers under 100% represent high +EV and arbitrage potential. Divide each Breakeven Win% by the Overround. Quotient is No Vig Win Probability. Add all no vig win probabilities together. Sum should be 100%. Products are each team’s no vigorish Moneylines. An efficient betting market means each ML is a fair price. Better lines at competing sportsbooks represent Positive Expected Value +EV Bets. Bet each team at sportsbook offering best odds. See if any sportsbooks have moneylines greater than each team’s No Vig ML. Overround isn’t specific to one sportsbook’s numbers. It can be calculated from multiple sportsbook lines. This process identifies profitmaking opportuntities. Compare futures at multiple sportsbooks. Choose the most favorable line for each team. Combine each line into one futures market. Overround closer to 100% indicates higher +EV. Anything under 100% represents high +EV and arbitrage potential. Arbitrage bets always profit. Size wagers carefully using an arbitrage calculator. Place correct bet amount on each team. Realize a modest guaranteed return. There are 4 possible outcomes. Make 4 separate bets. Bet desired amount on the most lowest ML. Enter MLs for each remaining selection. Calculator figures for each bet’s size, total risk, profit and % profit. You are guaranteed a $10.77 on $269.23. It doesn’t matter which team wins!